A new stage adaptation of John Grisham's bestselling novel A Time to Kill has come to order on Broadway, starring Sebastian Arcelus as ambitious young lawyer Jake Brigance and John Douglas Thompson as Carl Lee Hailey, a man who takes the law into his own hands when a harrowing crime is committed against his daughter. Below, find out how this real-life story inspired the celebrated novel, a blockbuster film and now a thrilling drama on the Great White Way. 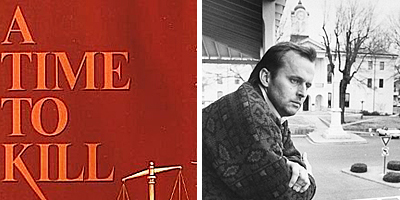 Grisham spent three years perfecting his first novel about Carl Lee Hailey, a black man who is tried in Mississippi after killing the two men who raped his daughter, and Jake Brigance, the idealistic white lawyer who represents him. After being rejected by 28 publishers, A Time to Kill finally hit store shelves in 1989, but it was not an immediate hit with readers. “Five thousand copies were printed and we couldn’t give them away,” Grisham says in the book’s introduction. Undeterred, the author filled his trunk with copies and drove from library to library, begging them to display his first novel. 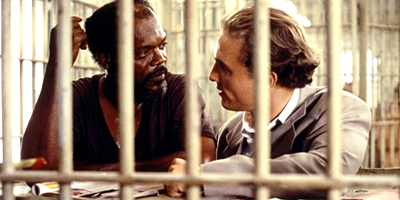 As Grisham’s books climbed the bestseller charts, his 1993 political thriller The Client sparked the interest of director Joel Schumacher. The film grossed more than $117 million worldwide, and the pair hoped to recreate their success with a movie adaptation of A Time to Kill, Grisham’s first (and favorite) novel. The pair attracted big name stars, including Sandra Bullock, Oliver Platt, Kiefer Sutherland and Samuel L. Jackson as Carl Lee Hailey. Although Kevin Costner and Woody Harrelson expressed interest in playing leading man Jake Brigance, neither seemed quite right to Grisham. Meanwhile, a virtually unknown actor named Matthew McConaughey was cast as Freddie Lee Cobb, one of the men who brutally rapes 10-year-old Tonya Hailey—but the 26-year-old actor had his sights set on the lead. “I’d heard Brad Pitt was playing the part, so I said, ‘Is Brad playing Jake?’ and Joel said, ‘No, do you think he should?’” McConaughey told Texas Monthly. The actor boldly proposed himself as Brigance, and Schumacher, who hadn’t yet found an actor that Grisham liked, agreed to a screen test. “The great part about Matthew,” said Schumacher, “is he’s the kind of guy every mother would like their daughter to marry, but there’s also a badass, bad-boy side to him. It creates a wonderful tension on screen.” Grisham agreed wholeheartedly, and the studio execs were relieved the pair had finally decided on a lead. A Time to Kill hit theaters in 1996, grossing more than $152 million worldwide and putting McConaughey on the map as a serious leading man. 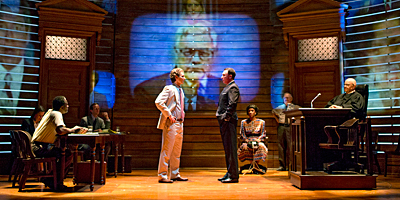 Holmes enlisted Ethan McSweeny (Broadway’s The Best Man) to direct—even though he wasn’t exactly a Grisham aficionado. “At that time, I had never read the book and I had never seen the movie, and that was considered a great virtue because I could come at the play on its own terms,” the director told Broadway.com. “Of course, now I know the book almost by heart. I’ve come to really enjoy and respect John Grisham’s work.” In 2011, Arena Stage in Washington, D.C. agreed to produce the stage thriller, but McSweeny and Holmes were still searching for their Jake Brigance...until an actor known mostly for his roles in musicals like Elf, Wicked and Jersey Boys entered the audition room. “From the moment Sebastian Arcelus came in to audition, we knew we had found our Jake,” said McSweeny. 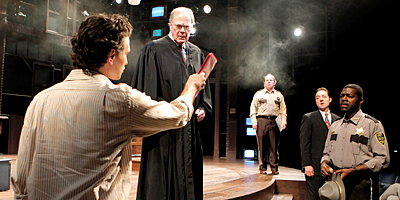 “Sebastian brings a great sense of determination, enthusiasm and even sometimes naivete to Jake, and I think it’s really crucial.” With their leading man in place, McSweeny cast Broadway alum Erin Davie as Brigance’s wife Carla, Dion Graham as Carl Lee Hailey, Evan Thompson as Judge Noose and Brennan Brown as defense attorney Rufus Buckley. The production received an encouraging response from critics, but Holmes knew revisions were needed before bringing the play to Broadway. While reworking the script, Holmes eliminated the role of Carla, played by Davie, and set the action of A Time to Kill almost entirely in the Mississippi courtroom. “A Time to Kill is a 600-page novel with about 200 characters, and trying to bring [that] to the stage presents a challenge,” Holmes told Broadway.com. Paring down the production to a cast of 14—still large by contemporary Broadway standards—helped streamline the action and bring the trial center stage. With Arcelus reprising his role as Jake Brigance, the Broadway production boasts a cast of heavy hitters, including John Douglas Thompson (Cyrano de Bergerac) as Carl Lee Hailey, Patrick Page (Spider-Man) as Rufus Buckley, Emmy winner Tom Skerritt in his Broadway debut as Lucien Wilbanks, Ashley Williams (How I Met Your Mother) as law student Ellen Roark, Tony winner Tonya Pinkins (Caroline, or Change) as Hailey’s wife Gwen and former Tennessee senator Fred Dalton Thompson (Law & Order) as Judge Noose. See A Time to Kill, opening October 20 at the Golden Theatre! A stage adaptation of John Grisham's best-selling novel.